The Supreme Court offers 12 free spaces for a moot final judged by a Supreme Court Justice each year. 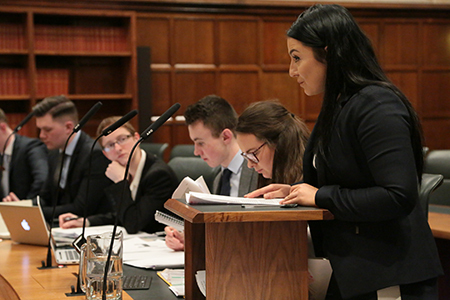 The moots run between February-May and offer law students the opportunity to practice their advocacy skills in front of Justices from the highest court in the land. Applications for the 2018/19 programme have now closed. We received a large number of applications from across the United Kingdom this year. Finalists were selected from areas including Northern Ireland, Scotland, the Midlands and the South East. We will launch the 2019/20 competition in Autumn 2019. Applications are open to accredited higher education law programs and student-run societies only. For more information please contact enquiries@supremecourt.uk quoting 'Moots'. Law schools/societies which are not offered one of the 12 free slots, but still wish to hold a moot at the Supreme Court, can hire a courtroom for £250 plus VAT. They will have to arrange for their own judges and also still adhere to point 7 of the General Terms and Conditions.